These warm, delicious, gingerbread cookies will fill your kitchen with the cozy scents of the season. Rolled thin for a crisper texture, or rolled a little thicker for more of a cake-like feel, Gingerbread Cookies will add the perfect touch to your winter baking. These cookies have a sweet, mild, flavor that children love. 1. In a medium bowl, whisk together the flour, baking soda, ginger, cinnamon, cloves, and salt. Set aside. 2. Using a stand mixer on low, beat the butter and sugar together until smooth and well combined. Beat in egg until combined, and then molasses. 3. Add the flour mixture, about a third at a time, scraping sides of the bowl as necessary, until well-combined. 4. Divide the dough into thirds, and wrap in plastic wrap or place in lightly greased zip lock bags. Refrigerate for at least 2 hours, or overnight, if possible. The colder the dough is, the easier it is to work with, and the longer it rests in the fridge, the better the flavors can blend and develop. 5. Preheat oven to 350 degrees. Lightly flour a sheet of parchment paper the size of your cookie sheet. Using a very well-floured rolling pin, roll part of the cold dough out onto the sheet of parchment paper to about 1/8" thick (the thinner you roll the dough, the better the cookies will hold their detail). Using cookie cutters dipped in flour, cut cookies about an inch apart. Gently peel the excess dough away from the cut cookies and set excess dough aside to re-roll. Slide parchment paper with cookies onto cookie sheet. 6. Bake cookies for about 11 to 12 minutes or until just beginning to very lightly brown. Let cookies cool on cookie sheet for 5 minutes, then remove cookies to cooling rack until completely cool. 7. While one pan of cookies bakes, you can prepare the next pan for baking. Always return any dough you're not using at the moment to the fridge to keep it cold. Once the dough gets warm, it softens and is harder to work with. It's better to keep the dough cold than to add a lot of flour. 8. Store cookies in an airtight container, and they will keep well for several days. These freeze well, too. To make the hearts: I used purchased refrigerated sugar cookie dough. Cut off a few inches of dough and place on a lightly floured surface. Sprinkle dough liberally with flour and knead in until well mixed. Knead in a few drops of red food coloring until it is the desired shade. Again, keep this dough refrigerated until needed, and in between rollings. On a lightly floured surface, roll the dough to 1/8" (or thickness of your gingerbread cookies). Cut heart shapes with a small cookie cutter. Using the same heart cookie cutter, cut hearts out of the house-shaped gingerbread cookies and remove. Carefully place the sugar cookie heart into the gingerbread cookie and bake. This goes more easily if the dough is very cold. You could bake the gingerbread hearts into small cookies, but I just rolled them back into the gingerbread dough. Gingerbread Cookies may have been taken to some of these great parties! I just love these Gingerbread cookies. The heart in the center is just such a wonderful thought. You are a very patient person! Thanks so much for sharing these at the Fill The Cookie Jar group. I have pinned them and will be sharing! Joy, these are adorable! I love gingerbread cookies. And I love how you put the heart in the center of each of these. So cute! Joy, these are so adorable and they sound delicious, very festive. Awesome cookies, Joy! They are so perfect. The bright red heart in the middle is just adorable! Thank you, Marlys. They were kind of labor intensive, but once I got the idea in my head, I couldn’t “not” do them. :) I enjoyed seeing your beautiful Pumpkin Chai Biscotti! These are such cute cookies! I love the hearts and they're perfect for Thanksgiving. Thank you, Heather! I loved your Cranberry Thumbprint Cookies! Joy these looks so good but I have to also add -- the idea of rolling them out ON the parchment -- brilliant! Never thought to do that and I have baking forever, too! Thanks! I shared it with Amara's Mommy, too! What a wonderful, classic recipe! Love the hearts in the center! Also, love the idea of heart cookies to go along with the housrs! You and I love the classics, don't we? :) I really did have fun making these cookies, Scarlett, especially the old-fashioned gingerbread men. I love your cookies, Joy! I will have to try doing this type of cutout, I know it will be a hit. And, then I don't have to worry about any other decorating! One of my favorite cookies grandma used to stir up! I am going to make these little hoses and send to all my grandkids! They will love it! Gail, my grandson really loved these, so they are grandkid-approved! ;) I do love the old-fashioned appeal of these cookies- so traditional for the holidays! I need to make these. I am going to bookmark so I can make these for Christmas. Great recipe. I love gingerbread and these are super cute. I love the hearts! I love the idea of the colored sugar cookie filling! Gingerbread is one of my favorite holiday treats, thanks for the recipe and the beautiful pictures! Super cute and yummy idea for the holidays! I am starting to give baking another shot, so will bookmark this!! Visiting from Sharefest - hope you can stop by! Thanks for a great recipe and another fun link up! Thank you, Sami- they are great with coffee! ;) Thanks for joining us for Let's Get Social Sunday! Yum! One of my favorite Christmas cookies are gingerbread men. :) I would love to have you share this on The Creative Home & Garden Hop today! Your Gingerbread cookies are just beautiful and homey. I could see right away I needed to start a new board on pinterest just for cookies. Yours being the first pin. Thanks so much for sharing you gingerbread cookies on the Good Neighbor Hop. Lynn, thank you so much- they were so much fun to make! If you pin something from me, I will be honored! :) Thank you for creating and hosting Good Neighbor Hop! So cute, Joy! How sweet would these be on a Christmas cookie tray?! Thank you for stopping in and linking! Michelle, I like mine on the thinner side, too....not only can you probably make more cookies that way....I figure you could eat a few more, too. Seeing as how they're so thin and all. ;) Thank for hosting See Ya in the Gumbo! Those cookies are super cute and look YUMMY! Joy, I just love the idea of putting a heart in them- so cute! And I love the reminder of what Thanksgiving is REALLY all about. We are also trying to keep gratitude in our hearts this holiday season. 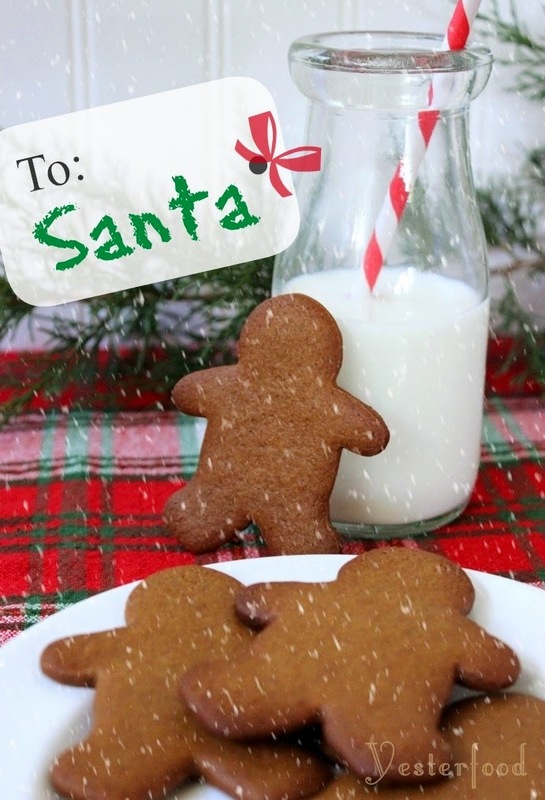 I would love to fill my cookie jar with your awesome Gingerbread Cookies! Having Sweet Tea with you from Sweet Tea Social, enjoy your day! I'm delighted to see Thanksgiving symbolized by something besides a turkey! The warmth and love of "going back home" is expressed here so beautifully! Sure, the eating is always great, but just being together is the best part for most of us! Oh, thank you, J, that's it exactly! :) Family and togetherness is highlighted this time of year, and that's what these cookies meant to me. Thank you for coming by! Joy, the home and heart cookies are so special. I've never seen cutouts quite like that. Makes me want to start baking. Oh, Joy, those are so cute, and I can almost smell that delicious gingerbread aroma! Thanks for the recipe. Vashti, I think you would make a wonderful cookie monster! :) Thank you for coming by, and thanks for pinning my li'l Thanksgiving cookies!! I will have to try those out this year! Gingerbread cookies are delicious. I love the hearts!!! These are SO beautiful! I am a huge cookie lover, and LOVE making and decorating cookies! I make lots and lots of gingerbread cookies every Christmas, and can't wait to make some in just a couple of weeks! These look beautiful!!! Thank you so much, Maria! Cookies are just too much fun, aren't they? :) These were lots of fun to make! Happy Baking! I love the little houses! They are too cute! G'day Joy! Love gingerbread and baked goods made with love, true! Your cookies brightened my day! Thank you! The red heart baked into the cookie is so charming! These are lovely--both in appearance and in their link to thankfulness! I should make these with my kids and sing the Veggie Tales song about a thankful heart. Have you heard it? These are so cute, Joy! I just love the little hearts! Thank you, Veronica! I always love it when an off-the-wall idea actually works out! ;) Thank you for the visit! Joy, I just LOVE these beautiful gingerbread cookies and the heart just makes them extra special! :) Thank you so much for joining us and sharing at Best of the Weekend! Pinning and sharing! Have a wonderful weekend! Cindy, you are such a sweetheart- thank you for coming by. I'm so happy that you liked my li'l Thanksgiving cookies. :) Thank you for pinning and for sharing- I always enjoy Best of the Weekend! These look absolute delish and like a great pair up for a cup of gingerbread latte :) Thanks for sharing and happy SITSSharefest! These are too cute. And sound yum. I love your pictures, too. I really need to get better at pictures for my blog posts. You're inspiring me! We don't celebrate Thanksgiving here in New Zealand, but really who needs Thanksgiving to enjoy a plate of these cookies - gorgeous. What great Gingerbread Cookies, we would just love these! Thank you so much for taking the time during this busy season to share your wonderful post with Full Plate Thursday. Have a wonderful weekend and hope to see you again real soon! I love those heart cookies! So adorable! Thanks, Andi, they were so much fun to make! :) I'm really enjoying Saturday Night Fever! Thank you, Jamie, I am thankful for you! :) I'm so glad you and Evelyn have teamed up on Freedom Fridays (I miss All My Bloggy Friends, though). I had pinned these when I saw them, but didn't get to come read until today and find out how you made the hearts. Clever! Aww love the little hearts!! Thanks for sharing at Throwback Thursday. Thank you, Denise- they were so much fun to make! :) Thank you for coming by, and for hosting! Joy... You just make me want to visit Texas!! Of all my years baking, I have never made gingerbread men because I have a friend who is so good at it. But, I LOVE the Texas cookie for Santa. Looks like I may have to get to bakin'! As a child, I disliked gingerbread cookies... but they've grown on me as the years have gone by, and these gingerbread cookies sound like perfection. Nothing says the holidays to me more than gingerbread, so I'm happy you have shared this recipe! Thanks, again, for participating in Christmas Cookie Week! There's just nothing better than the scent of baking gingerbread on a fall day. Thank you Joy! Pinned!